Flower buds signify a renewal of life and many types of flowers are engraved on headstones. The symbolism behind the Carnation, Daffodil, Daisy, Passion Flower, Poppy, Sunflower and Tulip has been researched in a previous post. The less commonly used flowers are identified below. Acanthus is one of the most common cemetery motifs associated with the Heavenly garden. The Lotus represents perfect beauty; purity; resurrection and spiritual revelation. The Violet is a symbol of humility. And lastly, a flower that seems to cover every aspect of life, the Morning Glory: birth; the brevity of life; departure; farewell; love; mortality; mourning; resurrection and youth. It is also a symbol of beauty. Her hands were clasped upon her breast. Death and grief are felt in the same way throughout the world regardless of religion or race. We are unified only in birth and death. For I to you was only lent. In love I lived; in peace I died. You asked my life but God denied. Farewell, dear friends, and cease to weep. In Christ I dwell; in Christ I sleep. 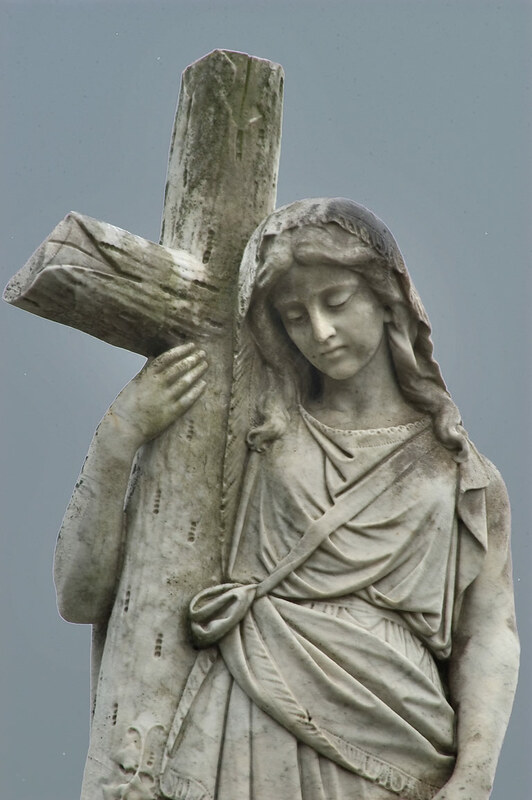 A woman clinging to the cross is a symbol of faith. It is often accompanied by the verse Rock Of Ages Cleft For Me signifying that a person’s only hope when lost in a sea of sin is to cling to Christ’s cross. A woman holding a cross represents faith. Such are as faithful in love shall abide with him. A sleeping chamber for eternity, this graveyard is attached to St. Munn’s Church in the village of Kilmun. The village is located on the shores of the Holy Loch in the Scottish Highlands within the Loch Lomond and Trossachs National Park. Gravestones are located not far from the shore and stretch beyond onto the hillside. What a beautiful serene setting. We miss thee but it would be wrong to wish thee back again. A very common symbol on gravestones is the winged effigy which represents the deceased soul in flight. Another winged effigy sometimes seen contains a skull and is known as Death’s head. It is usually depicted without the lower jaw.